July 2018 marked the 20th anniversary of the landmark tax legislation that created the Low Income Taxpayer Clinic (LITC) Program. Part of the IRS Restructuring and Reform Act of 1998, the LITC program grew out of a “Taxpayer's Bill of Rights” included in the law that enshrined the right of representation for taxpayers dealing with the IRS. Each year since then, the Internal Revenue Service (IRS) has awarded grants up to $100,000 to qualifying organizations to provide an LITC for low income taxpayers who have controversies before the revenue service. The College of Law is one such organization. Its LITC—where student attorneys handle cases under the close supervision of Clinic Director Robert Nassau—has provided services to the Central New York community since 2002. To mark the anniversary of the legislation, Nassau has posted a video on the IRS's Taxpayer Advocate website to add his voice "to the chorus of happy birthday wishes to the Low Income Taxpayer Clinic program." "It is an honor for the College to have been part of the national LITC community for 16 of its 20 years," says Nassau. "During that time, hundreds of College of Law student attorneys have assisted thousands of lower-income taxpayers in resolving tax controversies. The students not only gain real-life practical experience, they also help taxpayers get tax justice." Specifically, Nassau says that in its 16 years of operation, 326 student attorneys have represented nearly 1,000 clients and informally advised approximately 1,500. "We have recovered $1,338,502.28 in cash for our clients, and we have helped them avoid or reduce tax liabilities of more than double that amount." The College's LITC was created by Professor Martin Fried and the late Sherm Levey L'59, a tax expert who was a LITC Co-Director with Nassau. 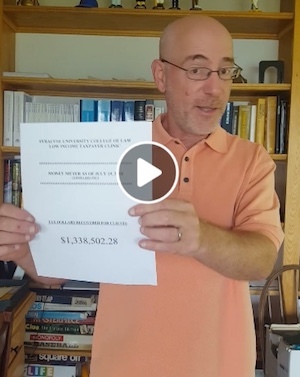 "They were involved in getting our first grant, along with Professor Arlene Kanter and Professor Deborah Kenn, when she was Acting Director of the College’s Office of Clinical Legal Education" Nassau explains. "We have gotten grants every year since, and for the last handful of years, we have gotten the maximum $100,000 annual grant." According to Nassau, the College's LITC offers students a practical opportunity to learn how to represent taxpayers with real-world tax controversies. Students learn basic tax procedure and applicable substantive tax law, and they represent clients in administrative proceedings before the IRS and in judicial proceedings before the US Tax Court or federal district courts. Nassau's video is one of several birthday wishes recorded by LITCs throughout the country, including those at Texas A&M University and University of Denver and at non-profits such as Bay Area Legal Services and the Maryland Volunteer Lawyers Service. Today, the LITC program consists of 134 clinics in 48 states and the District of Columbia. From 2012 to 2016, LITCs represented more than 52,400 low income taxpayers and educated more than 450,000 low income and English-as-a-second-language taxpayers about their rights and responsibilities under the US tax code.